These rankings are my own creation, but are based upon the general methodology used by FIS. My primary complaint about ranking skiers using FIS point lists is that they give no indication about variation. Namely, how certain are we, really, that a 5.3 FIS point skier is better than a 7.8 FIS point skier. Also, I consider it slightly odd to use a full calendar year of races, rather than those from a particular season. I recognize why FIS does it this way, I just think that it can lead to some weird behavior that I’d prefer to avoid. 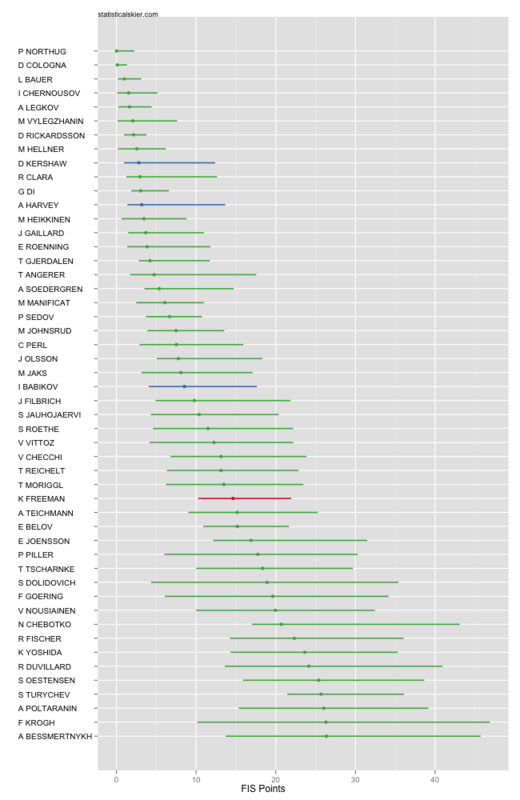 Each plot shows a racer’s average of their best five races, just like FIS. Unlike FIS, I simply omit skiers with fewer than five races. The error bars represent how much variability we might expect in that skier’s best five races based upon their entire season. If you are familiar with calculating the standard error of a mean, this is somewhat different. I’m actually bootstrapping each athlete’s races and recalculating the average of their best five on each bootstrap sample. If the previous sentence sounded like gibberish to you, all you need to know is that for technical reasons, my way is more appropriate. I’m only showing the top 50, for brevity. A very rough rule of thumb is that the degree of overlap between the bars for two athletes gives us an indication of how certain we can be that one is truly “faster” than the other. The more they overlap, the less certain we are that there’s truly much of a difference between the athletes. See this post for a more detailed (and entertaining) discussion of these rankings.